I used canned pineapple instead of fresh and it still tasted very good. I did not add any pepper although it is mentioned in the original version. I added 1/2 tsp of methi/fenugreek seeds. 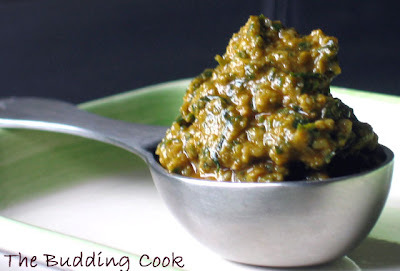 The only major change I made was to use masoor dal instead of split moong dal. My raita had onions & cucumber. I pretty much stuck to her recipe for the most part; just added some walnuts, pepper & a tsp of fresh lemon juice. Thank you for sharing your ideas and recipes gals! Isn’t that great?... it has only been a little over a month ago that I started blogging and this is my 2nd award! Yay! Thank you so much, Padma. It is really very nice of you. Since most of you have already received these awards and passed them on, I will just hold on to this one. Great post there TBC. The pictures are simply fabulous. Is that pineapple curry, at first look i thought those were potatoes. 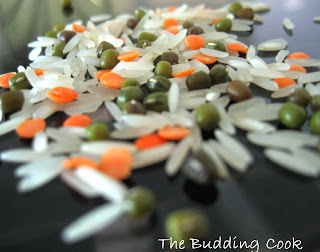 I particularly love the strewn rice + dal picture. Most of these are in my must-try list too. Glad you found the time! Those are some mighty fine choices you made in dishes to replicate there and they all look fantastic. Congrats on your well-deserved award! What a spread you have, beautiful pic and congrats on your award. TBC, that spicy pineapple looks ...slurp slurp slurp... bet your gotcha! and congratulations! Shows your interest. Everything has come out well. 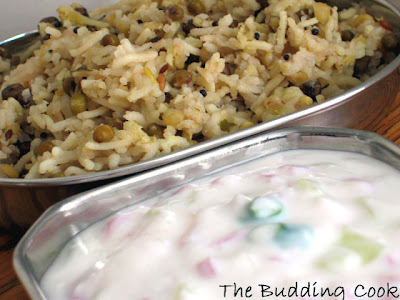 hey, that kichadi raw material pic is very pretty :) it's fun trying all these dishes, congrats sweetie. great looking recipes. that sure looks like worth a try. congrats on the award. nice to know u are actually trying other bloggers recipes.so nice of u. congratulations for the award u got.u deserve it. 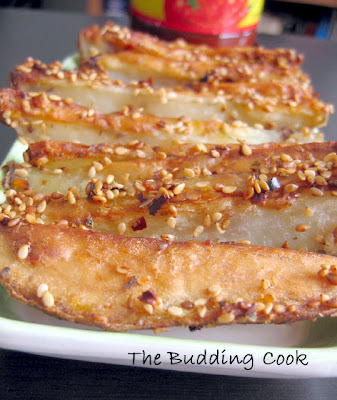 What a fabulous idea to post recipes from others blogs.. The spicy pineapple looks way too yummy..Nice pictures BTW. You ARE rocking! I especially like the last pic if the gravy in the spoon. it has such a cute shape! Now you better change you name from budding to perfect or experienced or whatever cook! you take lovely pics indeed. cobgrats. Congrats on ur awards !!! I'm really glad you stopped by my blog. It's been pleasure visiting ur blog. Delicious recipes and beautiful pictures. Keep it up. I have tried so many dishes from other blogs but I almost always forget to take pics! My " must try list " of recipes seems to be never-ending! Cynthia, thank you:-)You started it & now we have all " rocking people " in the blogosphere. Thanks. Pesto itself was new to me . I had heard of it before but never actually made it.It tasted so good. I had it with some garlic bread yest. Richa,thanks.Yes, it is so much fun & now there is so much variety in my cooking.My hubby is not complaining either! i second coffee...change ur name tbc:) i am glad u tried n liked kichidi n raita. Just kidding - the photos are mouthwatering! My eyes are on those potato wedges. My oh my, those meals look delicious. And congratulations on the award. You deserve it! Patricia, yeah , I know that feeling. I think one lifetime is not enough to try out everything! 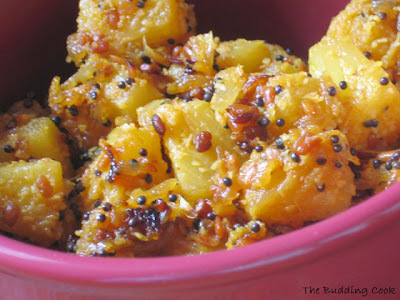 They Spicy Pineapple look really good and the recipe sounds interesting. Very nice pictures TBC! I liked the rice on for the kichidi. Its nice to see the ingredients too, I'm too lazy to take pictures of them half the time. Congrats, you are a rockin girl! Thanks for visiting Simple and Delicious! What a nice blog you have girl! Wonderful pictures..keep up the good work! ohhh goshhhh all makes me mouthwatering! A second award in only a month of blogging - well done. It shows how popular and enjoyable your blog is. : ) Very tasty recipe renditions you have here. I can't take my eyes off the pineapple, but everything looks so good. Kevin, thank you for visiting. Bharathy, thank you for the kind words.I have tried out so many recipes from other blogs but have not taken pics always. Rachana, I've tried so many... always forget to take pics!.